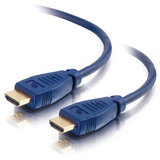 The Velocity HDMI cable delivers a strong combination of performance and value, and is a high performance home theater interconnect for high-definition DVD players, HDTV receivers, TV sets, projectors, a/v receivers, and other HDMI-equipped devices. Enjoy high-resolution digital video and true digital audio, delivered together in one convenient, compact connection. High quality materials and construction ensure a lifetime of dependable performance. Fully-shielded conductors provide complete immunity to EMI/RFI interference, and 24-karat gold-plated connectors ensure superior signal transfer. This fully-functional, high-bandwidth cable is tested to perform at industry standards and is backed by a lifetime warranty.